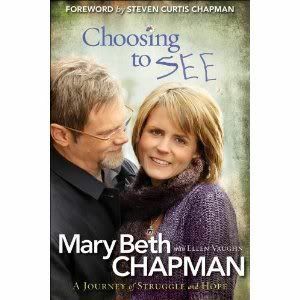 I was contacted by Revell books and sent a copy of the amazing book Chooseing to SEE: A Journey of Struggle and Hope by Mary Beth Chapman and Ellen Vaughn. For this week's MM, the theme is mobile music. I've been watching some old-school Rat Pack Youtube video's this week, so I chose Sammy Davis, Jr., singing Mr. Bojangles since it's about dancing. In watching Frank & Dean & Sammy, etc. I realize how much Justin Beiber, Miley Cyrus, The Jonas Brothers, and the rest really have to learn to be a real "entertainer". I think it's sad that our kids will not know what real performers are like. Head over & see Amanda at Bloggin' With Amanda to check out Musical Monday! 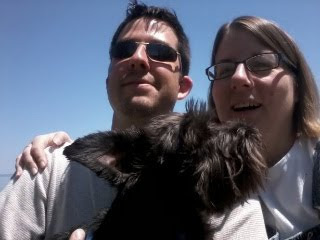 Today I am proud to celebrate 7 years being married to my best friend. I know it's cliche to say you're husband is your best friend, but Chris & I were best friends before anything else. We weren't going to fall in love. I was a terribly wounded woman hurt by a cheating husband who had left me. I was never going to expose myself and my boys to that kind of pain again. 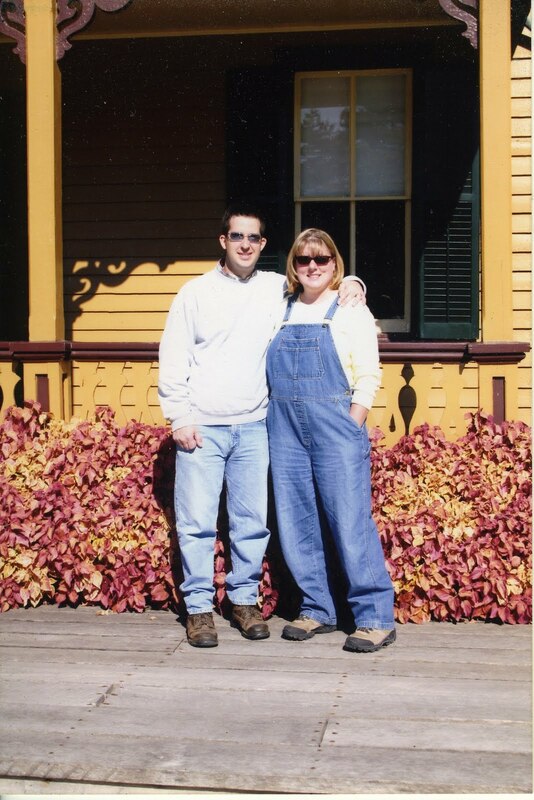 Chris sure wasn't going to get bogged down with a woman who was 2 years older with a ready made family. Luckily we perservered and love each other more than ever. I couldn't ask for a better influence for our boys, or a better supporter for me through all of my illnesses. 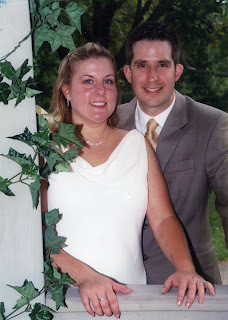 Thank you Chris, for being such an amazing husband! As you may know, JumpStart was gracious enough to let me review their new Get Moving Family Fitness games for the Wii and giveaway a copy to one of my bloggy friends. Susan from Crave The Savings! So many thanks to all of you who entered, I wish I had games to give to all of you. I do think it's cool that Susan won, though because her daughter goes by a nickname like I do. 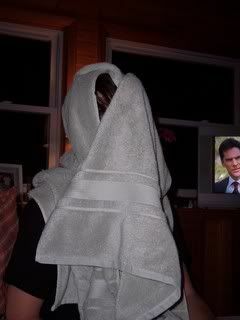 One guess at what it is...yep, Mimi! I hope Mimi and Susan love their game! 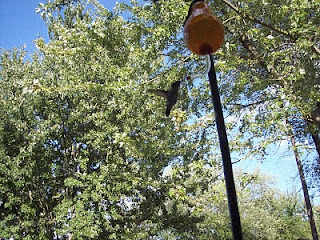 Well as you may have read on Oskar's Blog I have a humming bird feeder next to my computer desk. 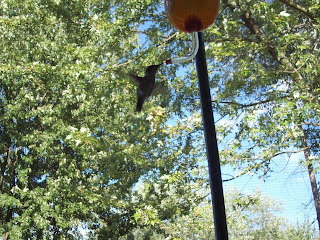 This week there has been 2 or 3 baby hummingbirds visiting all day. Finally with a great amount of stillness & stealth I was able to catch some photo's. 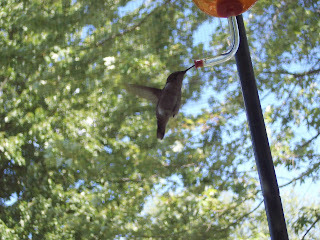 It's so cool to see them come all day. 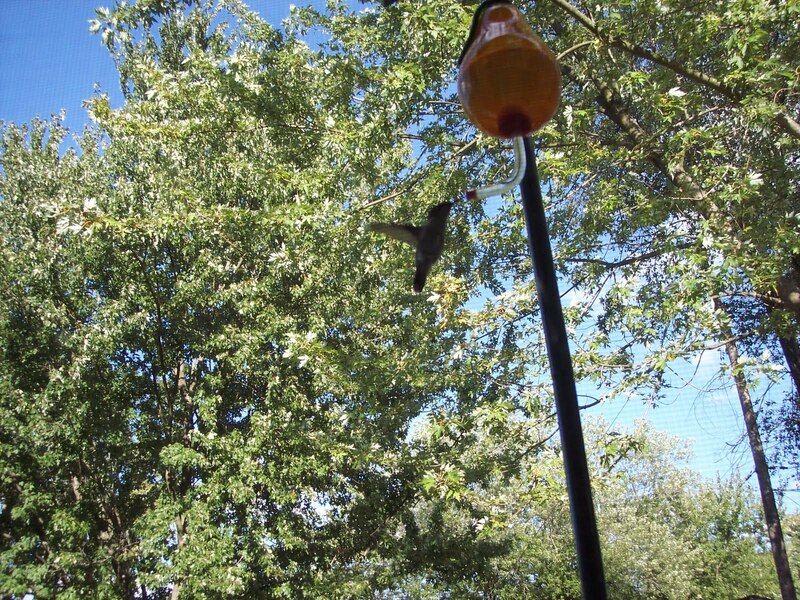 You can hear the flurry of their wings as they approach. 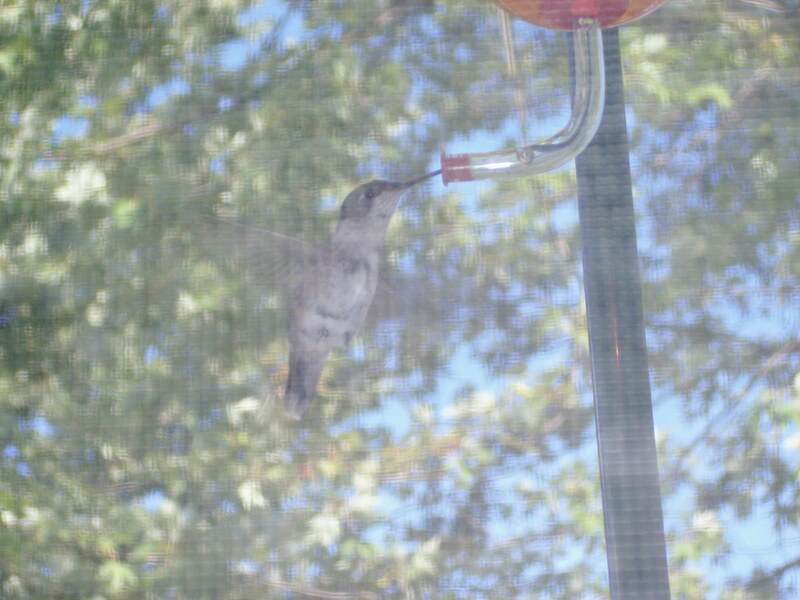 The second picture was taken through glass while the rest were just taken through the screen. I wish I could mark them so I knew how many of them there are. 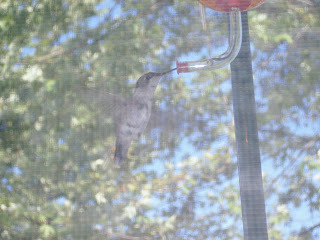 It's really cool, cause they come about 20 times a day! 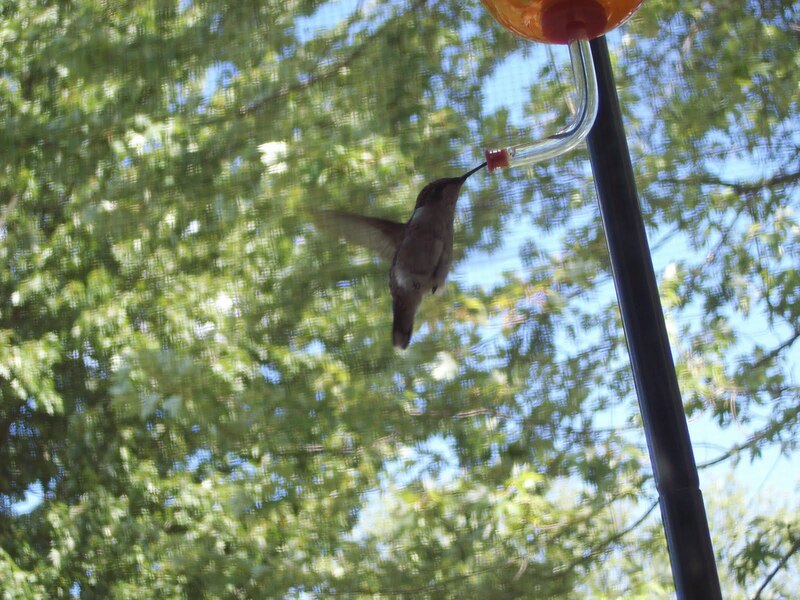 Check out what all the other Camera Crittters are up to! 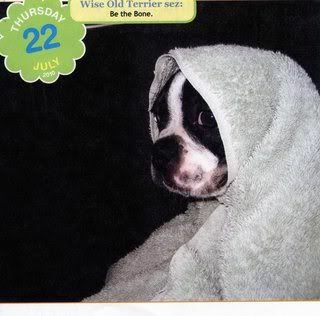 And this pup from my Cute Overload calendar. My great bloggy friend Amy from Keeping Up With The Schultz Family, started a new tag game & I wanted to play along! Amy says, "I thought it would be fun to do a new tag. I wanted to do a back to school tag. I know some of us may have children who are attending school. Or remember our back to school days. I hope you enjoy this tag and join in. Answer these 5 questions below. Then tag 5 blogging friends to play along. Be sure to let everyone know who tagged you." 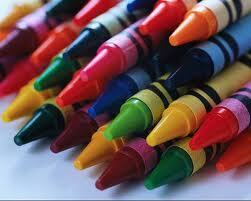 What was your favorite back to school item to buy? There's no way I could pick just one! I loved having new notebooks & pens. I still lurve me some office supplies! What was your favorite subject in school? Theater classes, also english. Did you ride the bus or get a ride from Mom/Carpool? I walked to elementary school, got bus for Jr. high & the beginning of high school and then drove or rode with friends for the rest of high school. Do you have a sack lunch or cafeteria food? In elementary school sometimes I walked home for lunch, sometimes I took my lunch (bologna & ketchup on white bread was a favorite!) & sometimes I bought it. Jr. high I almost always bought cafeteria food and high school either I bought at school or drove to a fast food place. I still remember loving pizza burgers & turkey slop from my school cafeterias! What is your favorite memory from your school days? All the new friends and people I got to be friends with. Now I get to tag 5 friends to play along! Jeanny from Jeannie's Happy World. Carolina from Brinkbeest In English. Obviously if you want to play along, just go for it! Have fun & tell us about your school memories. Today while driving from yet another doctors appointment I was feeling pretty sorry for myself & then a great set of songs came on the radio & changed everything. First it was Donna Summer with Dim All The Lights - GREAT SONG! That set the pace and next was Kelly Clarkson with Since You Been Gone. Next up an 80's classic, Cutting Crew with I Just Died In Your Arms. Then U2, With or Without You. If you don't watch any of these other videos, watch this one if you're a U2 fan. This girl is just so lucky & Bono was just so sweet with her. Next was Shania Twain, who makes me gag like I have a hair stuck in my throat, but that was saved by the Plain White T's and Hey There Delilah. If you don't know the story behind this, he wrote the song for his girlfriend while he was touring and she was an Olympic skier in training. That line, "Times Square can't shine as bright as you" gets me every time. When I got home I dug out a bunch of my old CD's. Everything from the Red Hot Chili Peppers to Billy Joel, George Strait, to Lionel Richie. I'm transferring them into my computer and then onto my Ipod and am making a mental note to all music back into my daily routine. Felling low? Get out some old CD's or even cassettes and sing into your hairbrush! OK, maybe this isn't really breaking news, since the story is from 2008, but I just heard about it so I'm bringing it to my loyal Screaming Mimi readers, umm 2 years late. Taiwan being on the forefront of all things cute have opened a Hello Kitty hospital. Yes that is the nursing staff dressed in the Hello Kitty aprons. "A Hello Kitty-themed maternity and pediatric hospital has opened in Yuanlin, Taiwan. The small 30-bed facility is authorized by Sanrio." I don't know if it's fascinating or horrifying, but it's sure different. 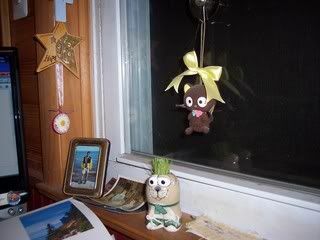 This picture and story came from Boing Boing. This concludes your (old) breaking news for today. My Own Little George Gobel! My husband always get me cute things to put around me. He loves to put a smile on my face. Yes my husband rocks! 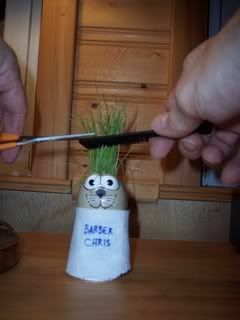 He got me this little Chia Pet kind of guy that grows grass "hair". 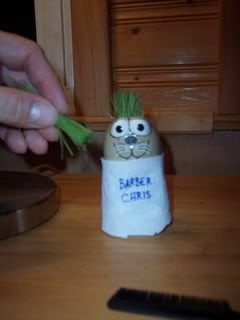 His hair got too long so Chris gave him a haircut. (Yes Chris goes along with my bloggy madness, too). Time for little Georgie to have get a haircut. 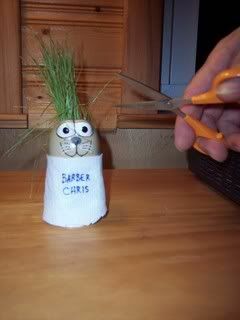 Barber Chris thought a flat top was in order. Here he is in his place of honor with all my other happy things that surround my computer. 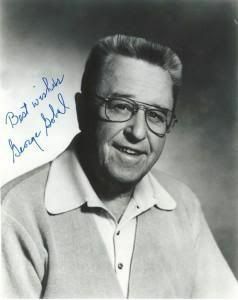 For those of you who are too young, this is the real George Gobel. Today Chris brought me in roses from the garden, cleaned out the drain in the bathroom, totally cleaned the living room and cleaned out the cat boxes. Once again, my husband rocks & I think I might be the luckiest woman alive! Wii Jump Start Get Moving Family Fitness Review & Giveaway! I have been lucky enough to work with Jump Start in the past on their family games, and Get Moving Family Fitness does not disappoint. Brooke Burke, mother of 4 is the host of this adventure and I found her to be a great host, and she looks amazing after having 4 kids! The graphics are great & really inviting drawing in little ones & adults alike. 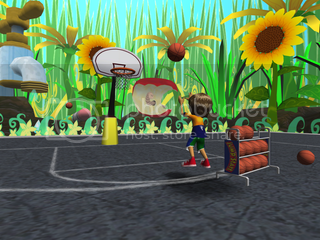 The scene above is playing basketball in the "Bug View" setting. There are 11 different settings to play your games in which my testers & I thought was a nice touch. The games are geared towards things that kids and parents recognize and doing them in a fun way. Balance includes pinball & dodgeball, while racing had options like running track, speed skating (a personal favorite), a flying race & a bicycle race. Jump Start Family Fitness also includes, boxing, football, vollyeball, baseball and step aerobics. The kids I played with were so excited to play that they really didn't seem to notice that they were exercising, something that I really love about this game. With the winter months coming this is a great way to get your family off the couch & doing something fun & healthy. This is a perfect option for any family with a Wii system, Jump Start has another hit on their hands! 2. Follow Screaming Mimi. 3 entries, leave 3 comments. 3. 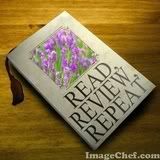 Follow my Read, Review, Repeat blog. 2 entries, leave 2 comments. 4. Blog about this giveaway & leave me the link in the comments. 3 entries, leave 3 comments. 5. 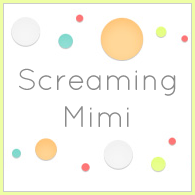 Add the Screaming Mimi button to your blog. 2 entries, leave 2 comments. 6. Follow Screaming_Mimi on Twitter. 1 entry. 7. Tweet about this giveaway. 1 entry daily. "Win a JumpStart Get Moving Family Fitness Game for the Wii! #giveaway @Screaming_Mimi - http://tiny.cc/rgh4o"
Contest ends at 12:00 midnight, on Saturday 8/28/10 and is open to all countries. JumpStart provided me with a copy of JumpStart Get Moving: Family Fitness for my review. I am lucky enough to be able to review books for Revell, a division of Baker Publishing Group. I have to say that due to my recent hospitalization this review is late, but this book is amazing. Dare to live out your faith like never before! 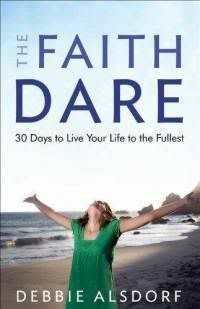 In The Faith Dare, Debbie Alsdorf encourages women to take her 30-day challenge to cultivate a passionate relationship with God. If you take her on, each day you'll be given a "daily dare" to help you develop a godly habit. The book includes a study guide, daily readings, affirmations, and challenges. Discover what a difference 30 days can make! Subtitled 30 Days To Live Your Life To The Fullest, this book help those of us who are believers do just that. Debbie Alsdorf had me underlining passages at 3 pages in. I just saw so much of myself in this book and found so many ways to apply it to my life. The book is designed to be read in 30 days, but I kept going back & going over things that spoke to me that I ended up reading for longer than 30 days. I still refer back to it all the time. The book starts out by outlining what you should plan to accomplish & then gives you the tools to make real changes. Each individual day starts out with a prayer/praise for the day, followed by something called Today's Truth. Next is Today's Dare and then room and prompts for journaling about what you've learned and ends with a prayer. Each day's reading is only a few pages long making easy to fit into a busy schedule. I found this book really moving & it really helped me grow & feel closer to God & closer to who I would like to be as a woman. This book is available now at your favorite bookseller from Revell, a division of Baker Publishing Group. Pick it up, you really won't be sorry. So what does one do while spending 9 days in the hospital? Not much, but I did manage to take some pics so you could share my journey! Sounds fun right?? Here is the view from my bed. Because of my anxiety I always ask for a "window seat" so you can see the sunset. Yes I am 43 years old & I still take stuffed animals with me. 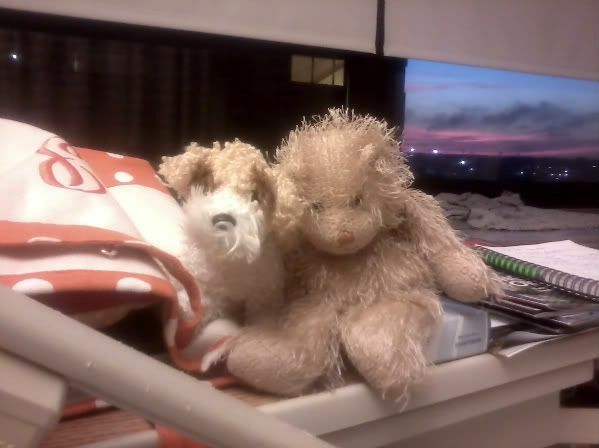 I spend 90% of my time in the hospital alone (Chris isn't allowed to take off work ~ don't ask) so they keep me company. 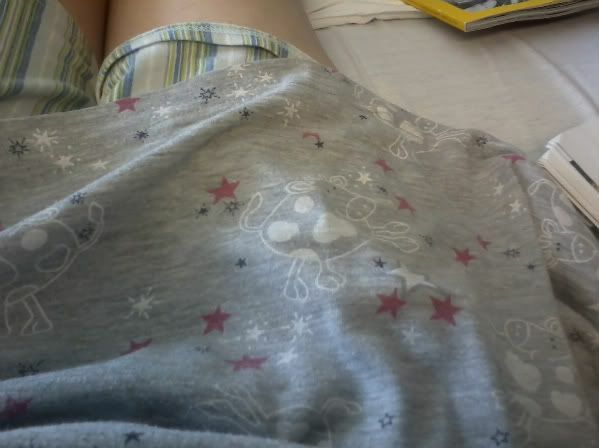 I also have my polka dot bag that I always keep packed for the hospital. It came from my friend Jen & all of those things help me to feel not so lonely. I keep lots of reading material in my bag. Here's my hosptial dinner. 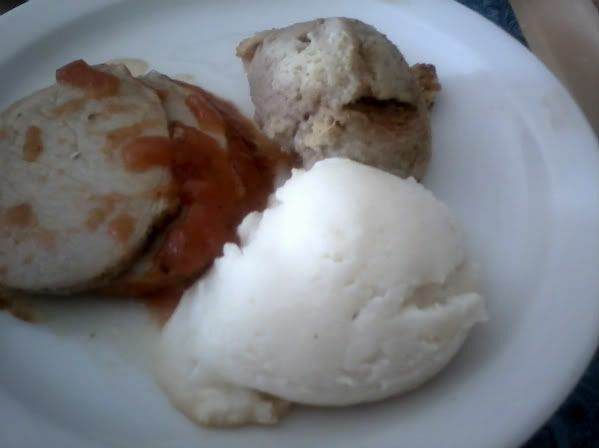 This is pork in some lovely, gelatinous orange gravy, with stuffing & mashed potatoes. This give you a good idea of why I stick to mostly jello, pudding, ice cream, etc. Rubber duckies. 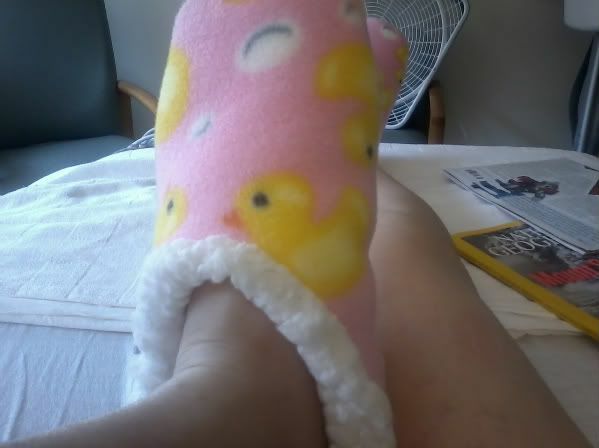 Everyone was jealous of my super cool slippers! 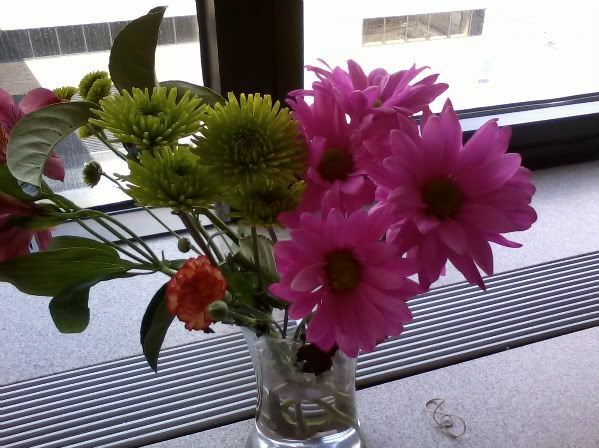 Flowers from my bloggie turned IRL friend Diane. Last but not least, my husband Chris. 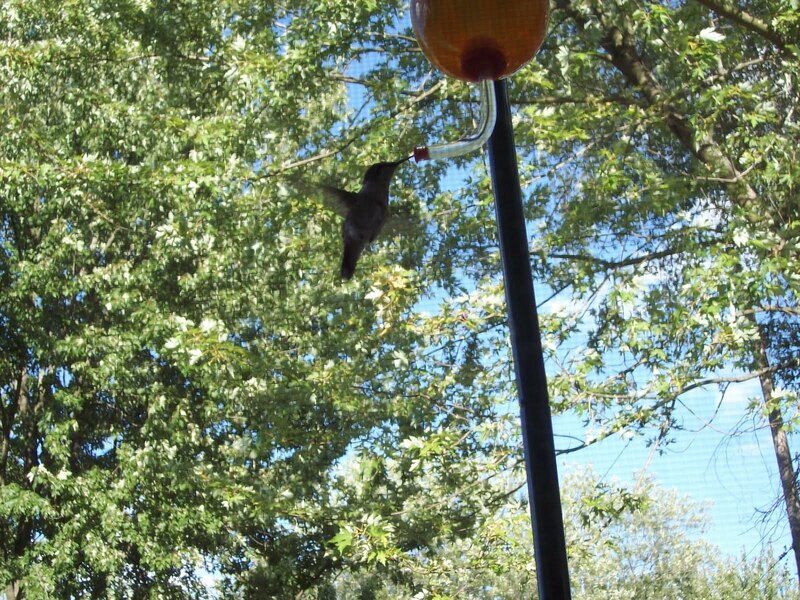 He works a million hours per day, comes to check on me & keeps the boys going at home. I don't know what I did to get so lucky, but I'm really thankful that I did! There you have my latest hospital visit. Sorry I couldn't share my pain killers with you, but they cut those off when I come home! * Today is your last chance to hop over to Read, Review, Repeat for a chance to win one of 5 copies of Madeleine Wickham's latest hardcover book, A Desirable Residence. Hey guys! After 9 days in the hospital I came home last Saturday. This was possibly my longest stay yet. I did find a new Dr. who is treating my bi-polar and my gastroparesis together, more of holistic approach. We have had a rough time lately, though. 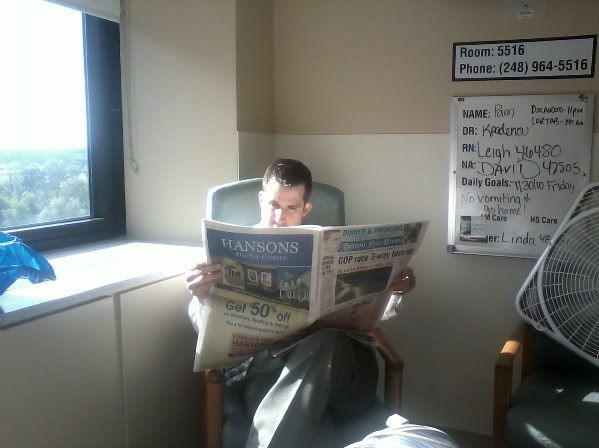 A few days after I came home my boys grandfather, not my dad but my ex-husbands dad, had an abdominal aortic aneurysm. It ruptured, but they caught it in time. 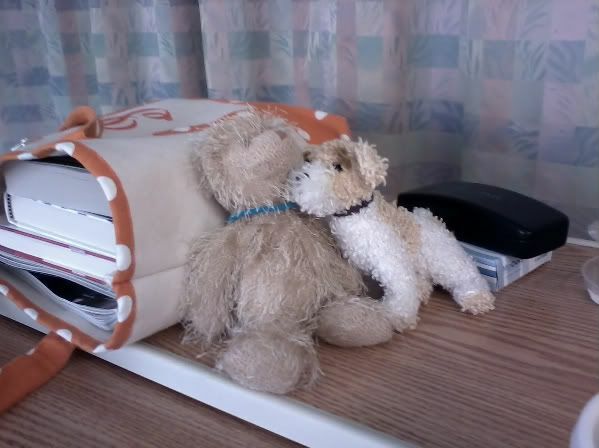 Unfortunately, the surgery set off lots of clots in his legs & they had to amputate both legs. Obviously this has been a really rough time for my boys and I'm thankful that I have been home this week to support them. He seems to be doing well now, but is still in ICU and has a long road ahead of him. I am slowly catching up & hope to be around to visit you all soon. Thank you for all of your prayers, well wishes & even cards. My blogging friends are really amazing people and I appreciate you all. * If you haven't entered my giveaway on Read, Review, Repeat to win a copy of Madeleine Wickham's latest hardcover book, A Desirable Residence, please hop over there now. Madeleine Wickham also writes as Sophie Kinsella and does the hugely popular Shopaholic series.